A corneal ulcer is a very serious infection of the cornea, the clear “window” on the front of your eye. The biggest risk factor for developing such an infection is contact lens wear, especially if worn overnight or for many hours per day. Because the cornea has less defenses compared to other parts of the body, medical treatment, typically with very frequent eye drops, is essential. Medical treatment almost always prevents loss of the eye. However, absolute strict adherence to the prescribed treatment protocol is a MUST, even if the drops are irritating. The drops are hard on the eye, but they are much harder on infection. 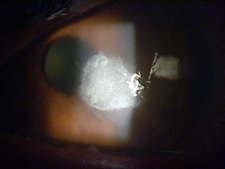 Aggressive infections can eat a hole into the eye and can even cause loss of the eye. Successfully eradicated infections may heal with scars that can distort vision and may require special contact lenses or even corneal transplantation to improve the vision. The pain can be quite debilitating with severe foreign body sensation, burning, tearing, light sensitivity, discharge, and crusting. The eye doesn’t start feeling better until a substantial portion of the infection has died off and the eye begins to heal. A corneal ulcer, for the most part, is tremendous inflammation in the cornea caused by infection. Most commonly, the infection is bacterial. Other infectious causes include fungi, virus, and acanthamoeba. There are even pathological states that cause inflamed corneal ulcers without infection. To understand what causes corneal ulcers, you have to understand what prevents them. What prevents most of the body from infection is our blood, which provides nutrients, removes wastes, and provides defense against infection. Blood contains white blood cells that function as the defenders of the body. If you get a cut in your skin, and bacteria or fungi get in past the surface, they will be killed quickly by white blood cells and other such defense systems present in the blood. The cornea is an extremely unique part of the body. It is completely transparent and clear, which allows it to focus light into the eye. It has no blood flow since blood vessels would make it opaque. The cornea is nourished by a clear fluid inside the eye, which can be thought of as hyper-filtered blood. Due to the lack of blood flow and hence low numbers of white blood cells, if bacteria or fungi get into the cornea there are minimal defenses to kill them. In other words, the cornea is almost a safe haven for these infectious agents. So much for them to eat (your cornea), without much to kill them. So why don’t we all have corneal ulcers all the time? The answer is the corneal epithelium and tears. The outer 10% or so of the cornea (the epithelium) is a layer of clear protective cells. These cells block infectious agents from penetrating to the delicate inner corneal layers. Just like the outer layer of your skin, the corneal epithelium continually sheds old cells allowing new cells to grow. We get an entirely new corneal epithelium every week. Anything that rubs away epithelial cells, accelerates their break down or prevents their growth increases the risk of a corneal ulcer. This can be a fingernail, a stick poking the open eye, or misdirected eyelashes. By far and away, the most common cause of a corneal ulcer is contact lens use. Wearing contacts for extended hours, sleeping in them, and not cleaning them properly increases this. Bacteria can stick to and colonize contacts and excessive wear can break down the corneal epithelium. Thus, contacts can carry the bacteria to the front door (the epithelium), then open the door to let them in. If your eye is red or sore, it is telling you that you may be having trouble with your contacts and that you should not put them back in. People with dry eye often have less tolerance of contacts, and are prone to getting break down and infection with less wear time. Daily disposable contacts are less risky because every day you get a clear contact with no bacteria colonizing it from the day before. Your tears also provide defense from infection. Tears lubricate the epithelium and keep it healthy so it doesn’t break down. Tears also have special molecules in them that help to control and kill infectious agents. Dry eye conditions therefore increase the risk of ulcers. Corneal ulcers cause intense pain unless there is a problem with the corneal nerves. The pain feels like there is something in the eye, burns, and may cause a deep ache that is worsened by looking at light. The eye is red and there are typically a lot of tears with a yellowish discharge and crusting. The vision can be very blurry, especially if the center of the cornea is involved. Many other conditions can cause these symptoms. If your symptoms are intense, especially if you use contact lenses, be sure to seek care immediately. How do we diagnose a corneal ulcer? Your eye doctor can diagnose a corneal ulcer by examining the eye in the office. Your doctor may culture the ulcer, where some material from the ulcer is placed onto a culture growth plate so that it can be grown and studied in the lab. If the culture is successful, it may help to determine what antibiotics the infection is resistant or sensitive to. Such information is important if the infection doesn’t respond to the initial antibiotic treatment. How common are corneal ulcers? About 1 in 1,000 patients who use extended wear soft contact lenses develop a corneal ulcer each year. This risk drops substantially when daily disposable soft contacts or rigid gas permeable contacts are used. 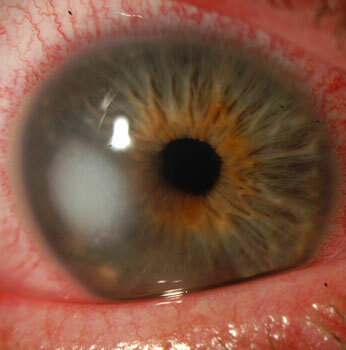 The lifetime risk of developing a corneal ulcer is about 1.5% for all contact lens wearers. How serious is a corneal ulcer? Corneal ulcers are very serious because they can severely blur your vision or cause loss of the eye. Some infections are so aggressive that they can eat a hole in the eye in just a few days. One of the most aggressive infectious agents, a bacteria called pseudomonas, causes over 50% of all contact lens associated corneal ulcers. If you are able to recover from the initial infection, it may heal with an opaque scar. Corneal scars can distort the corneal shape and harm its focusing ability. A hard contact lens may be able to help in this situation. If the scar is in the corneal center it can block light from coming into the eye and severely distort vision. Visual restoration may require a corneal transplant. How do we treat corneal ulcers? 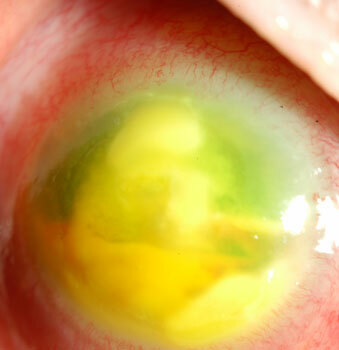 Corneal ulcers are treated with extremely frequent doses of one or more types of antibiotics. The antibiotics can be irritating, but it is crucial to follow your doctor’s instructions to save the cornea. As mentioned above, the cornea has no blood flow. That is why your doctor cannot simply give you a pill by mouth to kill the infection. When we take antibiotics by mouth, they get into our bloodstream where the antibiotic is distributed throughout the body to constantly bathe the infected area. Because the cornea has no blood flow, pills will not work. To constantly bathe the infection in antibiotic, you have to do it manually. This is most commonly done with antibiotic eye drops. When you put a drop on your eye, it washes away in just a few minutes. The effect of each drop may last more than just a few minutes since some is absorbed into the cornea. Unfortunately, the effect with each drop doesn’t last long. That is why your doctor will have you take the medications every 5 minutes for the first hour or so to load up the cornea with medication. After the first hour, you will likely be allowed to back off to taking the drops every hour. Your doctor will tell you the necessary instructions specific to your case. In some serious cases, we have successfully treated corneal ulcers with injection of medication directly into the cornea. Hydrating the tissue as such can help to get a higher concentration of medicine into the cornea quickly. How long does it take to kill a corneal ulcer? Corneal ulcers have to stop getting worse before they can start getting better. How quickly an ulcer heals depends on the infectious agent and the patient’s unique biology. Generally, an ulcer stops getting worse within just a few days. It then heals over completely within several more days to weeks. There are many considerations if an ulcer is taking longer to heal, and your doctor will discuss this if necessary. What are empiric antibiotics and fortified antibiotics? Because corneal cultures take days to reveal what the specific infecting agent is and about one-third of the time don’t show anything, we have to start treatment before we know with certainty what is infecting the cornea. Sometimes, the patient’s story or the eye exam can give clues as to the type of infection. Your doctor has to select medications that will cover the most likely suspects for your case and will try to cover as many entities as possible within reason. This practice is called broad spectrum or empiric antibiotics. Your doctor often needs antibiotics that are not commercially produced by drug companies, or needs antibiotics at higher concentration than what drug companies typically produce. These are called fortified antibiotics and will most likely have to be made at a special compounding pharmacy. How can Prokera help after the corneal ulcer has healed? PROKERA are the only FDA-approved therapeutic tissue products that reduce inflammation and promote healing of the ocular surface. It is a biologic corneal bandage device useful for a wide variety of corneal surface diseases including corneal ulcers. Amniotic membranes, which are obtained from the placenta during a planned Cesarean section, have anti-inflammatory properties, promote regeneration of the corneal epithelium, and reduce corneal scarring. Click here for more information about Prokera.